Do you have relationships you want to strengthen? 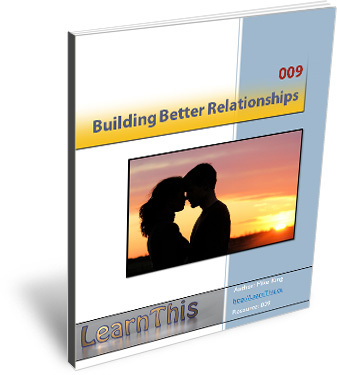 We all strive for relationships to be improved somewhere in our lives and that is what this eBook is for. It’s a guide to explore how you can begin to build better relationships today and get much more out of them in your life. Relationships are the single most important things that impact our lives and affect our health, mindset and happiness. This book explores the different aspects of relationships and how you can quickly and easily put specific actions and behaviors into place to break old negative relationship habits, and to form new healthier, stronger, more meaningful relationships. View the eBooks page for more info on Building Better Relationships and hopefully, future eBooks as well. Not everyone learns or enjoys reading. Some of us are audible learners or have more time available to listen than to read. That is why there is also a full MP3 audio recording of the audio book read by the author, Mike King! You will gain access to download the mp3 audio with the PDF upon purchase. The best way to change habits and to make improvements is to actually take action! That is why this book includes a 3 page workbook to help you assess your relationships and ensure that you reflect and plan specific actions to make the most of your relationships. I’ll be updating my eBooks page on the LearnThis.ca site here with reader’s quotes and referrals for the book so I’d be happy to include any links or references from readers if you purchase it. I’d love to hear your thoughts, would great appreciate any promotion you can help me with and I look forward to the reactions from this Book. It was a joy to write and even more to learn from and put it into action. I have a lot of work to do as well, as relationships are certainly not easy, but absolutely worth every second of investment. Get The eBook, the Workbook AND the MP3 audio version all for one low price! View my eBook page here for ordering Building Better Relationships and future eBooks. My Bodyweight Training WebApp Released! Do you recognize and appreciate your relationships. I could stand to get even better at building my relationships. Your eBook sounds like it would be such a great read for me. Thanks for sharing!! .-= Jarrod@ Optimistic Journey´s last blog ..You Know You’re Favored by God When… =-. I love the last line you have shared – about how relationships are not easy, but so worth it! Definitely!!! And I look very much forward to reading what you have created! Kudos to you for taking the time to create something that really all of us can use in some way – building those stronger relationships. .-= Lance´s last blog ..There Are No Little Things =-. @Jarrod – Thanks for the message of support. I absolutely hope you enjoy it and yes, it is an area we should really all read a bit more about since relationships can be so difficult. .-= Dragos Roua´s last blog ..The Magic Fairy Exercise =-. Thanks Dragos, I’m no stranger to recognizing that fact, that is for sure. Thanks so much for the encouragement, it means a lot! Congratulations Mike for releasing your ebook/audiobook. I too dream of publishing my own IP someday. @Farouk – Thanks for the support and encouragement! Its great to hear these stories from people that it has a new level of success. @Career – Take a step towards that dream today! Its not hard to start, its hard to keep it going!! @used tires – Thanks so much and I agree that this topic was an important one to venture into. In fact its an area I haven’t written a lot on but definitely plan to add more to it here at the blog as well, as its a vital part of each of our lives. I’m happy to release and start this area as an ebook though as its a new area from me so the whole ebook is fresh material and not yet explored much for free in my articles here. You will definitely enjoy it if you purchase, and would appreciate any help you offer to pass along or share this. Thanks for the support as well! Congratulations on this Mike. It must be amazing to release something knowing that so many people will get to enjoy it. Good luck!